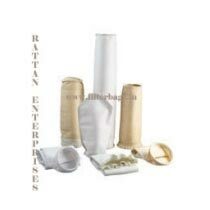 We especially provide Expanded PTFE Membrane finishes for every type of dust collector filter bag application. Expanded PTFE Membrane traps the particulate on the surface and allows more air to pass through filter media. Bag House engineers are capable of reducing capital and operational cost as well as have the ability to design Bag House for higher air flow, by using the ePTFE membrane coated filter bags. The ePTFE Membrane is in most cases the best economic choice for filter media. Use of ePFE Membrane coated filter bags also provide a degree of protection from unpredictable and unknown changes that sometime occur during Bag House operations.